A group of Palestinian children celebrating the launch of UNRWA's Dignity is Priceless campaign. The agency’s 711 schools, providing free basic education for Palestinian refugee children in the West Bank - including East Jerusalem - Gaza, Jordan, Lebanon and Syria - will open as planned in September. UNRWA operations have been hit hard by the United States decision at the beginning of the year to cut back its funding of the Agency by around $300 million. It constituted the largest ever reduction in funding in UNRWA’s history, leading to a severe financial crisis which threatened the existence of many of its critical assistance programmes; forcing cutbacks to its cash-for-work activities; and limiting the provision of assistance to only the most vulnerable. 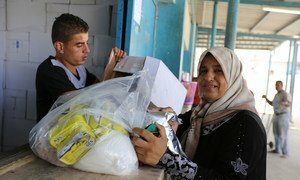 Since then, UNRWA has mobilised $238 million of additional funding from around the globe, but the money received so far only covers the Agency’s services until the end of September. Another $217 million is still needed to ensure that the schools stay open until the end of the year. Speaking to UN News on Thursday, UNRWA spokesperson Chris Gunness said that, despite the shortfall, the Agency felt obliged to open the schools on time: “For Palestinians an education is a passport to dignity. This is not a good outcome, but it’s the best possible outcome because the alternative would have been terrible, particularly for the next generation of Palestine refugees,” he said. “We are doing everything in our power to work with the donor community to ensure that we can implement and honour our historic mandate and mission,” added Mr. Gunness. A meeting of UNRWA’s Advisory Commission in Amman, Jordan, on Thursday was called to discuss ways to secure the resources needed to keep the schools running. Mr Krähenbühl called on Member States that have pledged funds, to transfer them as soon as possible, and for others to consider joining the effort to preserve UNRWA’s vital services to a very anxious Palestine Refugee community. 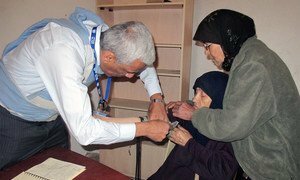 Non-communicable diseases such as diabetes, hypertension, cancer and smoking-related ailments, account for the majority of the chronic health problems confronting Palestine refugees across the Middle East, a new report by the United Nations agency which supports them, has found.